The gambling industry in Albania and Kosovo hits the most socially marginalized groups, while the governments in the two countries launch into opposing policies to tackle its damaging effects. For Gerti Lleshi, December 31 marked not only the end of 2018. It was also his last day working in Casino Apex in Tirana. On January 1, an estimated 7,000 employees in Albania lost their jobs after the Albanian government enforced a law which banned all forms of gambling across the country. The aim, according the government, was to tackle gambling addiction that would also protect the homes and families of those that bet excessively. To many Albanians, the rate of unemployment has grown as a result of illegal betting places and other forms of gambling, known as ‘games of chance,’ that work with no licences, which have spread nationwide. Gerti Lleshi from Elbasan remains one of the 7,000 jobless people after the Government of Albania had shut down all games of chance.| Photo: Eraldin Fazliu. 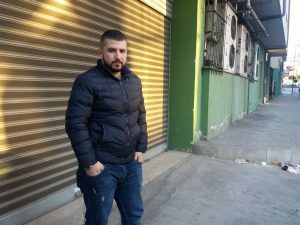 “It was never easier to rent a shop in Tirana during January,” said Lleshi with a smile while walking in Zogu i Zi neighborhood in Tirana, referring to the hundreds of abandoned shop fronts across the capital city. “I started to search for new jobs, as working in the casino seems to be over, or I might move abroad for some months to work,” he told Prishtina Insight. He is not alone in this search, either. According to Eurostat, Albanians peak in the rankings of the number of asylum seekers in the European Union, comparable even with the warzone countries such as Syria and Iraq. A study by the University of Sussex in England found that the potential migration rate from Albania grew from 44 per cent in 2007 to 52 per cent in 2018. Lleshi honestly admits that for him, having lost a job that paid him 35,000 Albanian leke (around 280 euros) per month, including extra tips, matters. Although jobless, Leshi is relieved not to see poor people gambling their last penny away in the casino anymore. However, Lleshi’s prayers may be out of reach. Kosovo: A new haven for gambling? The Tax Administration of Kosovo, ATK, confirmed to Prishtina Insight that out of four gambling companies from Albania that applied for licences to operate during 2018 and 2019, three were approved. Kosovo Customs said that this was not reflected in the transfer and import of machines used for betting across the Albanian border to Kosovo. Adriatik Stavileci, the spokesperson of Kosovo Customs, said to Prishtina Insight, “no export from Albania to Kosovo or ‘re-export’ of machines of games of chance to Kosovo,” occurred. However, gambling activities in Kosovo have started to increase, according to official data. The evolution of tax payments in millions through games of chance to the state. Graphic for Prishtina Insight by Granit Mavriqi/BIRN. In 2018, institutions involved in games of chance paid to the state around 15.8 million euros in tax, according to ATK. In contrast, in 2017, the amount of tax estimated to have been paid was 12.4 million euros. In 2014, only 10.5 million euros was paid, according to official data obtained by Prishtina Insight. The money provided to the state’s budget through tax on games of chance might dry up very soon, however. A concept document published by the Ministry of Finance in January formed a group that would amend the Law on Games of Chance. The goal is clear: to facilitate the business of gambling through removing excise tax, extending the validity of licences and simplifying other bureaucratic procedures. According to the Government, such a move would result in the opening of new jobs and economic development. Hekuran Murati, a Prishtina based economist, shares different views. “The only time when gambling can bring economic development is when we have touristic gambling, by creating resorts with casinos and clients that come from abroad to spend their money as tourists, as is the case with Las Vegas, Macau or China,” he said. For Murati, the government’s plan does not pay off in comparison to the detrimental consequences it would create in the country. “Creating some new jobs in the gambling sector cannot be compared at all with the economic and social damage from gambling,” said Murati, insisting that such a strategy will be a burden on the state’s budget, because it will increase the number of people reliant on the government’s social welfare scheme to stay afloat. The Government’s plan to draft the law was met with disapproval from by opposition parties and other people in Kosovo. Responding to the criticism that arose, Prime Minister of Kosovo Ramush Haradinaj complained that he was being “attacked” by his opponents, responding that he did not fully agree with the plan to draft the law. “I would have removed all games of chance and would not leave them in lievable areas,” he said. Nonetheless, Haradinaj’s personal links with gambling companies is not an untold story. The Alliance for the Future of Kosovo, AAK, high officials including Haradinaj were mentioned in an indictment named APEX in connection with bosses in the industry that were accused of organized crime. In an interview in 2010, Haradinaj admitted that the gambling industry has donated to his party, stating directly that one well-known betting company was a donor for AAK. “Yes, they are the party’s donors in fact, including ELKOS, Dukagjini and Play for Win… but there are other donors,” said Haradinaj. The indictment was dismissed in 2016. 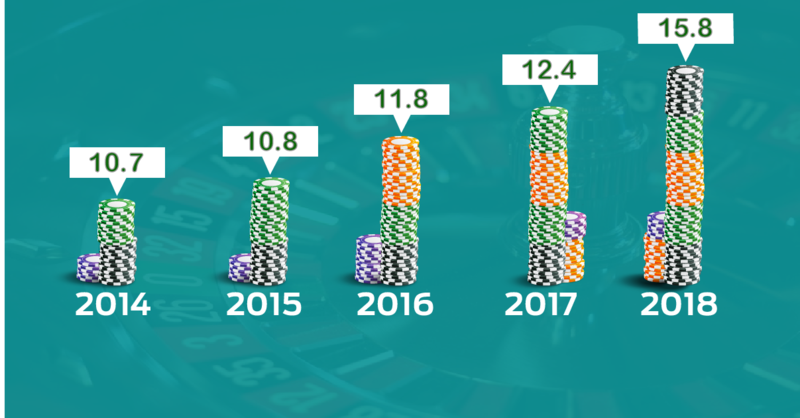 While Haradinaj continued to remain in office, the gambling industry started not only to increase officially, but likewise illegally. For instance, information from ATK states that there are 293 betting places in Kosovo. But the number is believed to be far higher in reality due to unlicensed gambling stores that operate against Kosovo law. One of these stores started to operate in December in the heart of Kosovo’s capital. In the neighborhood Ulpiana, a new betting store opened not far from the Elementary School, Hasan Prishtina. A newly opened betting shop in Ulpiana neighborhood, less than 500 meters from the Elementary School ‘Hasan Prishtina’. | Photo: BIRN. With no signs near the shop front identify it as a betting store except for its covered windows. Inside, there is barely any sign that would reveal it as a betting store, even when you receive a receipt for the bet placed. People young and old bet on various sports inside, but mostly football. The fog of cigarette smoke was not the only clear evidence of laws being broken. The store is only around 300 meters from the school Hasan Prishtina. Prishtina is not the only city in Kosovo teeming with betting places. 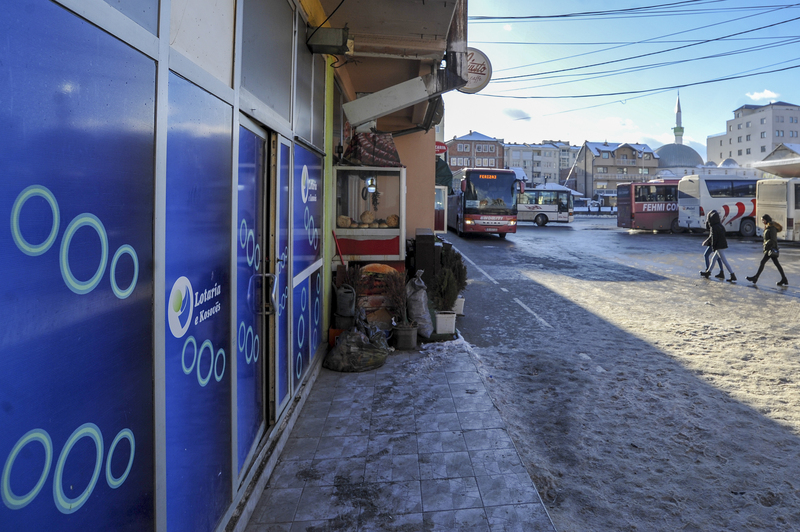 Just 30 km drive to the south, in Ferizaj, a betting store was opened in January and already operating in violation of Kosovo law from inside the city’s bus station. An illegal betting shop in Ferizaj’s station, violating the law as it is located less than 500 meters from the school and the mosque. | Photo: BIRN. The well known ‘small mosque’ in Ferizaj is around 100 meters distance from the store, while also the biggest Elementary School, Gjon Serreqi, is less than 400 meters away. “Betting and gambling exist everywhere, but we cannot close our eyes when a government incites dirty business,” complained *Artan to Prishtina Insight. Artan who worked in a betting company for more than 10 years, said that violation of the law is producing “irreparable” consequences, especially for youth. “I cannot believe that the municipality and the state is tolerating this, pretending they do not see the elephant in the bus station,” Artan said furiously. It is well known that all the secondary students studying in Ferizaj gravitate around the bus station where the betting shop is located, using the buses for transportation to the surrounding villages. ATK said that action has been taken to fight illegal games of chance, which encompasses casinos, betting stores, lotteries and other forms of gambling. “In 2017, 301 [locations providing] games of chance were closed,” ATK said. This state of affairs has primarily hit the most vulnerable parts of society. “This situation is contaminating our future,” said Artan. “Youngsters are sometimes playing with the 20 cents in their pockets, hoping to win anything,” he continued. The unemployment rate in Kosovo among youth peaked at 55 per cent in 2018, according to website Trading Economics. “Certainly, in a poor society where unemployment continues to remain a serious problem for Kosovo citizens, the games of chance look attractive for individuals who hope to win in a fast way,” said Albert Mecini, a sociologist from Prishtina. From a sociological perspective, Mecini considers that the consequences of this phenomenon reflect mostly in the stress and social pressure that youth experience in particular. “Addiction to games of chance exposes individuals to dangers that are connected with the financial nature of crimes, which as a consequence is directly manifested in the stance and behaviour of individuals,” said Mecini. Lleshi still has fresh memories of such consequences. “I saw one of the clients at midnight that was not answering his wife on the phone. He then told me that he had spent the money that he was supposed to use to buy medicine for her,” said Lleshi. But, occasionally, the betting stores play a social role, where people meet and create friendships. “There are people who wait for us to open the stores and we would spend the whole shift together, which also builds a friendship between us. There are cases when I asked my clients ‘I am going to grab some food, do you want me to take something for you’,” explained Artan, smiling. *Klodi from Tirana, who was the manager of a betting store in Tirana, had the same experience, but also warned of the risk of socializing with clients prone to a gambling addiction. “There are people with whom you watch football matches and enjoy time with them, but the problem is with the addicted players who often become aggressive,” said Klodi. A former betting store in Tirana at Zogu i Zi neighborhood. | Photo: Eraldin Fazliu. “Gambling is a worldwide thing and there’s nothing wrong with it if it is legal and controlled, but we are talking about youth and poor people being the target of it,” added Klodi. However, although all forms of betting, casinos and gambling are banned in Albania, many are skeptical that the government’s measures will stop the illegal industry. For Gjergj Erebara, an investigative journalist of Reporteri.al who has covered issues of games of chance in Albania, the impact of the government’s decision remains to be seen. Numerous people from north to the south of Albania have been arrested since the new year for having been involved in illegal betting. Although Erebara said that social research in the field is absent to deconstruct the phenomena of widespread gambling in Albania, his perception is that this state of affairs has an answer. “I know that in the last 10 years there has been no positive developments in the Albanian economy,” he said. In 2017, the licensed games of chance have reported a profit of 16 billion Albanian leke, approximately 130 million euros. The amount should be far higher, when taking into consideration illegal games of chance. Erebara is not the only one to support the government’s move to take action against gambling. “The category of poor people who feel lost will not be able to bet anymore, and for this reason I do hail the government’s actions,” said Klodi. Back in Ferizaj, the employer of the betting store said that central institutions alone cannot be blamed. “Since we have seen a change in power in Ferizaj with [Democratic Party of Kosovo] PDK coming to power [in the 2017 local elections], the situation changed for the worse,” said Artan. In the Municipality of Ferizaj, PDK is in coalition with Haradinaj’s party, AAK. 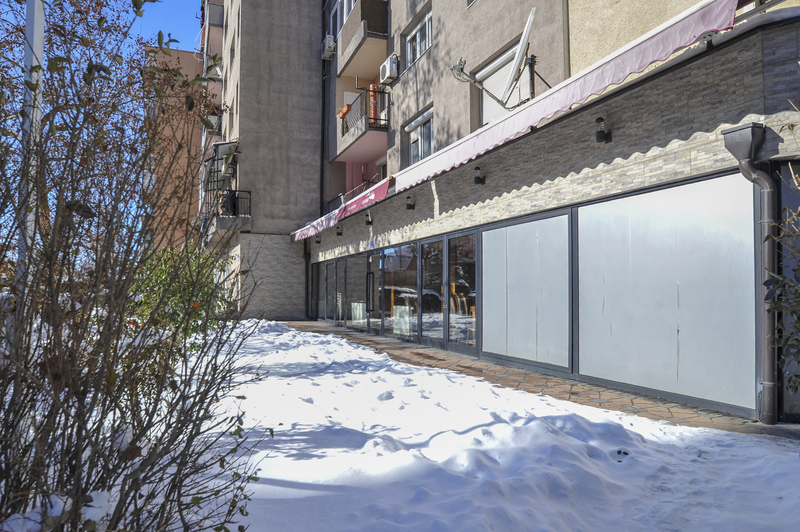 During LDK’s stint in charge of the Municipality of Ferizaj from 2013- 2017, all betting shops were banned from operating in the city center and were located in the outskirts of the city. 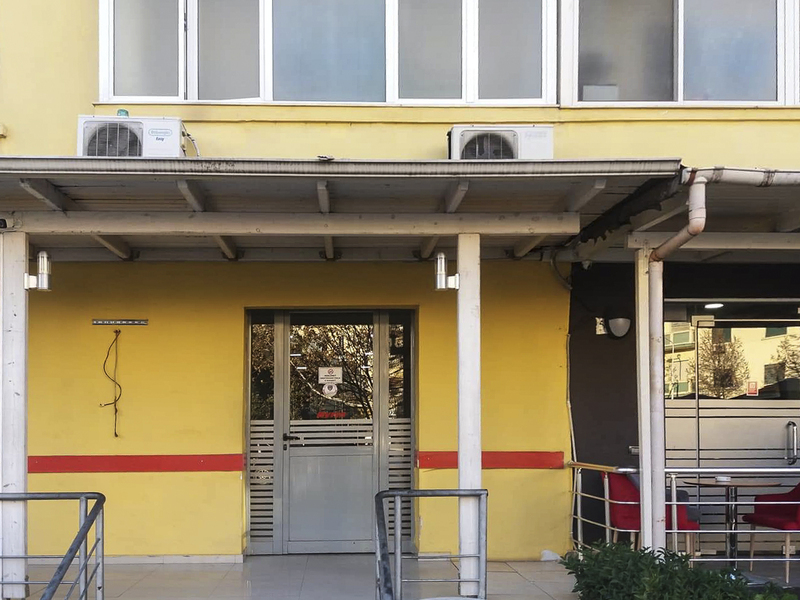 Betting places such as the store in Ferizaj’s bus station are a clear example how local authorities turn a blind eye towards illegal businesses. For Artan, the government needs to “radically” change its policies and enforce the law. “The government needs to stop this insanity, at least to protect young people,” he said. “Betting and other forms of gambling will continue as now most of our clients are even betting online but at least the government must protect the children and the poor,” he concluded. All names with asterisks* have been changed to protect the identity of those who did not agree to divulge their real names.